They're predicting "Thee Snowstorm" for later on this evening, in the Philadelphia metro region, and I believe most of the NorthEastern USA . Decided to go "outback" after I peeped out the window and saw "wildlife" rummaging about. 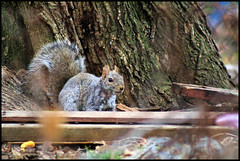 The squirrel was burrowing away and every few moments would lift his head up.